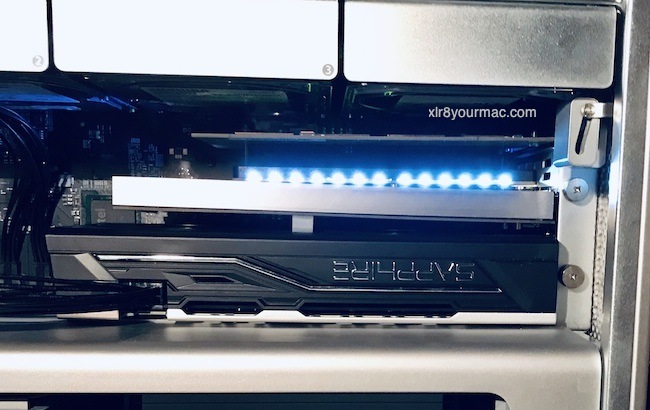 Reader "JMan" sent notes and benchmarks of this PCIe NVMe SSD card in his Mac Pro 5,1 running macOS Mojave 10.14.2. I/O Crest (SYBA SI-PEX40129) Dual M.2 NVMe PCIe Adapter Card with built in PCIe Switch, allowing a 2.0 PCIe to become a 3.0 PCIe with transfers up to 6500 MB/s. SI-PEX40129 card uses ASM2824 PCIe switches and therefore does not rely on PCIe bifurcation supported by CPU or PCH (i.e., they will work on closed end systems that have limited PCIe bifurcation capabilities) as well as on software RAID technologies supported by the platform. Dedicated PCIe 3.0 x16 bus bandwidth fully maximizes NVMe SSDs performance. FYI: Per Customer Support, this card only supports NVMe - it does not support AHCI base M.2. NVMe SSDs Used: Two 500GB Samsung 970 EVO M.2 2280 SSD NVMe blades. The Samsung 970 EVO 500GB NVMe PCIe M.2 2280 SSD blades can go from $130 - $170. FYI: There are reports of kernel panics if using the EVO PLUS NVMe SSDs. There are 2 different NVMe PCIe Cards in my Mac Pro, and there are 3 SSD blades. The I/O Crest Card has 2 NVMe Blades in it and so they show up in Slot 2 (2 entries). The Angelbird Wings Card is in Slot 3 with 1 Blade in it at 5GT/s with a link width of 4X. Shows x4 Link Width (970 M.2 SSD is X4), but with PCIe 3's 8 GT/s Link speed. Yes, there is Trim support with the I/O Crest Card. I've been running these cards for almost a month now, without any problems or anomalies. (OMMV) Obviously, your power supply needs to be working properly, you need to make sure everything on your PCIe bus is properly seated. I'm using a riser to separate the I/O Crest (x16 Slot 2) from the RX 580 GPU. The I/O Crest SSD's were formatted as Journaled HFS+ (Mac OS Extended) running Mojave, but you could also make it an APFS drive if you wanted to. I've modified the riser for the I/O Crest Card, so that it sits more perfectly horizontal. The riser is to give the I/O Crest card clearance over the fans of the Sapphire Pulse Radeon RX 580 Video Card. While there is a little fan noise coming from the 2012 Mac Pro, it is minimal and mostly from the Radeon RX 580 card. These I/O Crest (Syba) Cards sell for around $200 and are becoming quite popular because of the way they increase the Read & Write speed of your NVMe Blades. While they are primarily used for transferring data quickly for Film Editing, Photography and Music Professionals, they can also hold a Boot drive. (IIRC, Mac Pro 5,1 bootrom 140.0.0.0.0 from Mojave 10.14.1 update added NVMe boot support.) It is a great way for my old 2012 Mac Pro (5,1) to gain some of the speed you are seeing on newer Macs and PCs. My personal speed increased dramatically using the NVMe SSD card compared to an onboard SATA2 SSD Boot Drive of about 250 MB/s Read & Write. To say the least, I have no cons so far for this card. It is performing as advertised over the last several days. Since the MacOS release of 10.14.3, I figured this was a good time to wipe the drive and test the 2 blades in Raid 0. With the numbers I'm running on the I/O Crest in Raid 0 with two identical 500 GB Samsung EVO 970 blades, I am getting about 2570 MB/s Write & 2858 MB/s Read. So, the post about the card must be correct. With the Highpoint 1701A (Do you mean the SSD7101A-1? Appx $399, with RAID controller.-M) using 4 blades installed you will get twice the disk speed you are getting with the I/O Crest card. It's actually a little disappointing that the switcher doesn't give you better speed in Raid 0. "I know SYBA's product page is not clear about this point, but even though the SYBA has a PCIe x16 physical interface (i.e., the edge connector takes up an entire x16 slot's length), it still has only an x8 logical interface, so it will never be able to use more than 8 PCIe lanes of whatever slot it's plugged into. This means that when it is installed in a PCIe v2.x slot (such as the one in a silver Mac Pro), even though each M.2 stick can individually speak to one side of the Asmedia ASM2824 switch at their full v3.0 x4 (8GT/s per lane = 3.9GB/s total) as shown in the screenshots from System Profiler/System Information, the Asmedia ASM2824 has to funnel that down its other side into the v2.0 slot at x8 (5GT/s per lane = 4.0GB/s total) which means even a striped RAID 0 will never go faster than one single high-performance SSD since PCIe v3.0 x4 is essentially equal to PCIe v2.0 x8. ... each blade installed on the SYBA can run at its full speed/get its full bandwidth, they just can't both utilize it simultaneously. So installing this card even with a solitary v3.0 blade will improve performance over a "dumb" x4 adapter, it's just that there's no additional speed to be had by adding a second v3.0 blade and creating a RAID array. It's probably better to just leave them as two independent drives. This is probably why the Highpoint card gets better numbers, because the Highpoint card actually uses all of the slot's 16 lanes, allowing it up to a full 8GB/s of bandwidth when installed in a PCIe v2.0 x16 slot. This also probably explains why the Highpoint card is twice as expensive, too. Legal: Site Privacy and terms/conditions of use.